The New England Patriots finally return home this weekend after spending two out of the first three weeks of the season on the road and suffering back-to-back losses early this year. It’s going to be a tough matchup as the Miami Dolphins, who currently sit atop the AFC East at 3-0, are coming to town. Can the Patriots turn things around? Things are looking up, as the team will spend the next three straight weeks at home and have star wide receiver, Julian Edelman, returning for Week 5 action on Oct. 4. Playing Miami this weekend is their first test. The New England Patriots and the Miami Dolphins last met on Dec. 11, 2017 at Hard Rock Stadium. The Patriots fell to the Dolphins in a score of 27-20. 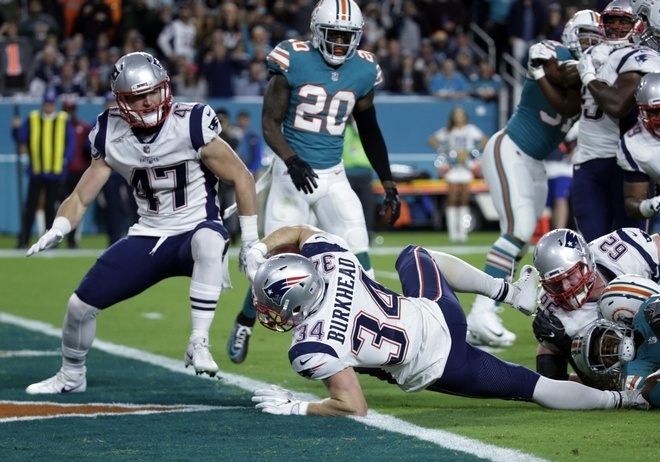 This loss snapped New England’s eight-game winning streak as Tom Brady was intercepted twice by Xavien Howard and the Patriots were held without a third-down conversion. It was a rough day for Brady and New England as Miami sacked him twice, hit him five times and held the team to just 25 yards rushing. Let’s hope that unlike this game against Miami and the previous two this season, that the Patriots get off to a hot start and come out ready to go. This game will be wide receiver Danny Amendola’s first game against his former team. Amendola spent five seasons with New England and helped the team win two Super Bowls within that time frame. Tom Brady was 24-of-43 for 233 yards, one touchdown and two interceptions, while Jay Cutler went 25-of-38 for 263 yards and three scores. Dion Lewis and Rex Burkhead each had five carries on the day for 17 and 8 yards, respectively. Burkhead also recorded a rushing touchdown in the game. Kenny Drake had a huge day for Miami as he rushed 25 times for 114 yards and had five receptions for 79 yards. Other top Miami receivers in this game were Jarvis Landry with eight catches for 46 yards and two scores and Jakeem Grant with two catches, 42 yards and one touchdown. Former Patriots, Danny Amendola led the way for New England’s receiving corps with six receptions and 76 yards. James White caught three passes for 11 yards and one score. Defensively, Devin McCourty, Patrick Chung, and Elandon Roberts led the way for the Patriots with seven total tackles apiece. McCourty and Adam Butler recorded a sack each on the day. For the Dolphins, Kiko Alonso posted eight total tackles, while Ndamukong Suh and Jordan Phillips notched a sack each. The Miami Dolphins travel to Gillette Stadium for a Sunday afternoon matchup with the New England Patriots. Game time is set for 1pm.